KUCHING: Opinion leaders across the globe must not incite hatred by demonising Islam or any other religion but instead should condemn extremism in all forms. 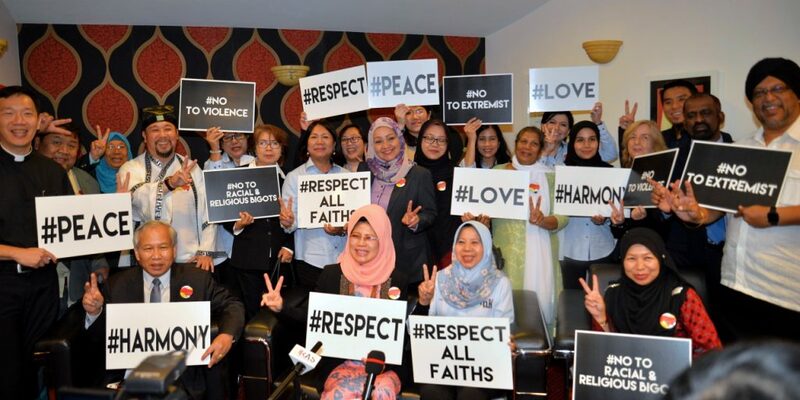 Sarawak Women and Family Council (SWFC) made this call in response to a terror attack at two mosques in Christchurch, New Zealand, that killed 50 and injured dozens of Muslims. Its chairperson, Datuk Seri Fatimah Abdullah, said SWFC condemn in the strongest terms the senseless, cold-blooded act of terror. “Such targeting of mosques seems to be the work of a few extremists, but it is apparent that Islamophobia was driving them and this needs to be roundly addressed as does extreme nationalism which vilifies migrants and any ideology spreading hate of our fellow human beings,” she said in a press conference after officiating at a state-level World Interfaith Harmony Week at the Islamic Information Centre (IIC), today. She stressed that no race or religion should be subject to fear and bigotry anywhere; no school, home, or workplace should breed such harmful attitudes. “All should be safe to pray safely whether it is in a mosque, church, temple, synagogue, or in their own homes. Let us not judge one another by one’s race or beliefs, or the colour of our skin or where we are from, nor condemn a community due to the actions of a few. “Outraged as we are by the terrible massacre, our reactions need to be ones which break the polarisation and hate which is trying to divide communities,” she said. Fatimah, who is also Welfare, Community Well-being, Women, Family and Childhood Development Minister, said now is the time for all to unite across faiths and work to stop violence and replace it with understanding and respect. “Never allow hatred and anger against Muslims or other faiths take root in our hearts, and let us teach our children the same,” she said. She said Sarawak has a proud history of diverse communities of multiple ethnicities and faiths living together in peace and harmony but we must not take it for granted. “We must actively encourage interfaith activities to increase understanding and bonds of friendship. We strongly support programmes by the Islamic Information Centre (IIC) and other agencies in giving the correct world view of Islam. “We applaud agencies like the Department of National Unity and Integration (JPNIN) Sarawak, Unit for Other Religions (Unifor) and NGOs such as Yayasan Perpaduan Sarawak for their continued efforts to build bridges across communities and faiths,” she said. With Kuching as a City of Unity which celebrates the Sarawak Interfaith Harmony Week, Fatimah said it is a timely reminder of the path to take and an opportunity for people to renew their bonds of friendship, acceptance and respect of and for each other’s differences for therein lay our strength that has bound everyone together as a people. “This is the message we ought to pass on down the generations as this is the road to a peaceful, harmonious world,” she said. She said it was everybody’s responsibilities to contribute through words, actions, activities, programmes be it at home, schools or wider community so that peace, harmony, unity, and solidarity will prevail not only in the fair land of Sarawak but throughout the world. SWFC expressed its heartfelt condolences to those grieving for their lost loved ones. They also prayed for the souls of the dead and for the speedy recovery of those injured. “We also pray for all who have been traumatised by the horrendous act. We hope that they find the strength and support they need to face the tragedy and work through the psychological pain it has caused,” she said. She said SWFC which is multi-racial and multi-religious stands in solidarity with the people of all faiths in New Zealand, especially those in Christchurch and their government. Council asks opinion leaders to condemn all extremism 0 out of 5 based on 0 ratings. 0 user reviews.